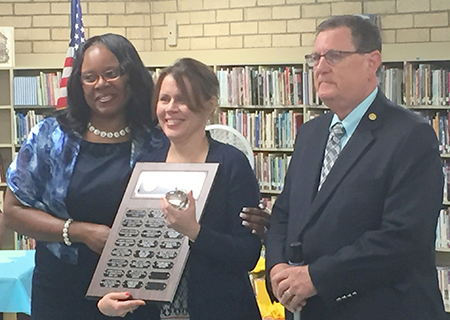 The Royal Palm Beach (RPB) Rotary Club presented the Crystal Apple Award to Damarise Reyes on May 4, 2016, at Crestwood Middle School. Damarise teaches English as a Second Language at the school. The award, presented by the club since the 1993/94 school year, is given to an outstanding teacher in Royal Palm Beach, and has become known as the “Teacher of the Year” award. The purpose is to bring awareness to the great teaching skills of the fine teachers in our school system, the wonderful things that they accomplish, and the influence they have on students in their classrooms. Damarise started her teaching career in 1985, and has been with the Palm Beach School system for over 20 years. She has two kids, both of whom have left home and living in California. She loves to teach, loves the students in her class, and feels that they have replaced her kids who have moved out. She was also recognized at the RPB Rotary Club weekly meeting on Thursday May 5, 2016.
and Tony Endler from the Royal Palm Beach Rotary Club.